My JRT, Ryder loves my husband Paul's socks. Clean or dirty it didn't seem to matter, he is always trying to steal them. I decided to go through Paul's socks and toss out all the holey ones. Ryder was exceptionally good while I cleaned out drawers and closets. He was rewarded with all of Paul's holey socks. He spent the afternoon rolling on and playing with these socks. 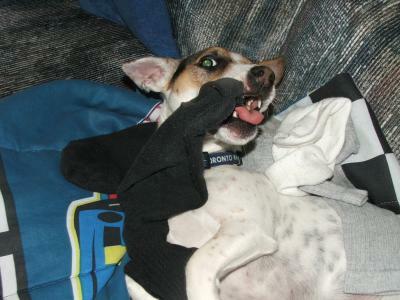 Who would have thought I would get such cute pictures from just a bunch of...holey socks! This dog looks like he is in his glory!